Many old Chinese charms were modeled after a well-known ancient Chinese coin. This coin’s calligraphy was simple yet elegant and the inscription expressed the primal foundation of the universe according to ancient Chinese philosophy. 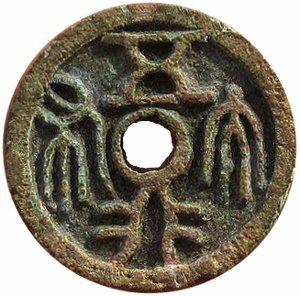 The coin was the wu xing da bu (“Large Coin of the Five Elements” 五行大布) which was cast during the reign of Emperor Wu of the Northern Zhou Dynasty (557-581 AD). The “five elements” (wu xing 五行) refer to the five fundamental elements of metal (金), wood (木), water (水), fire (火), and earth (土). 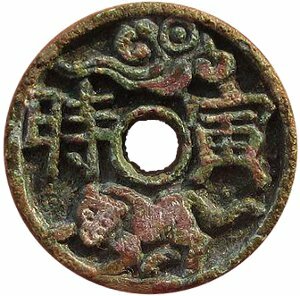 Chinese "Tiger Hour" charm based on the "Large Coin of the Five Elements"
The charm at the left, which recently appeared on a Chinese coin forum, is a fairly rare and beautiful example of a charm modeled after this coin. The obverse side has the same inscription and looks like the coin. The only difference is that the coin has a square hole in the center while the charm has a round hole. The reverse side of the coin is plain with no symbols. The reverse side of the charm, however, has both a Chinese inscription as well as other symbols. At the bottom of the charm is a tiger and at the top is an “auspicious cloud“. The inscription is read right to left as yin shi (寅时) which can translate as the “tiger hour”. While we are accustomed to dividing the day into 24 one-hour segments, the ancient Chinese divided the day into 12 two-hour segments know as shichen (时辰). Each shichen was named after one of the “Twelve Earthly Branches” (地支). The third “Chinese hour” or shichen, which would be 3:00 AM to 4:59 AM, was named yin shi (寅时) after the third of the Twelve Earthly Branches. Each Earthly Branch is associated with one of the 12 animals of the Chinese zodiac and the third animal in the series is the tiger. The Chinese believed that the period 3:00 AM – 4:59 AM was the time the tiger liked to hunt. But the tiger was perceived to be a symbol of protection as opposed to a source of danger. As to why the tiger is the third in the traditional ordinal system known as the Earthly Branches, there appears to be two explanations. The first explanation is that the order of the 12 animals was determined by an usual system based on the number of toes/hooves/claws each animal had and then alternating between even and odd numbers. For example, the first animal is the rat because of its unique feature of having an even number of toes on its front legs (4) and an odd number on its rear legs (5). The second animal in the sequence is the ox because it has an even number of toes (4). The remaining 4th through 12th even-odd alternating sequence continued with the rabbit (4), dragon (5), snake (0 which was considered “even”), horse (1), sheep (4), monkey (5), rooster (4), dog (5), and boar (4). An alternative explanation is based on an ancient folk story in which the Jade Emperor determined the order of the animals of the zodiac according to how they finished a “race”. These “tiger hour” charms offering protection and good luck are very old and can be dated back to about the same time period (557-581 AD) as the “Large Coin of the Five Elements”. Another fascinating article! Also, many thanks for the explanation of the traditions concerning the animals of the zodiac. This is indeed one of the most beautiful Chinese charms. The owner of this fine old piece is indeed lucky!